While eight species of badger exist worldwide, only one resides in Arizona: the American badger (Taxidea taxus), known across the United States simply as the badger. Part of the taxonomic family Mustelidae, this nocturnal, temperamental creature is best known for his tenacity and impressive digging ability. American badgers are widely distributed across the state of Arizona. They prefer to live in dry, open areas, where they can easily dig in the soil to make burrows and forage for food. Often found living on plains, grassland, farmland, golf courses and pastures, they easily adapt to a range of environments. They're happy to live at a variety of elevations, from sea level to high, alpine pastures. 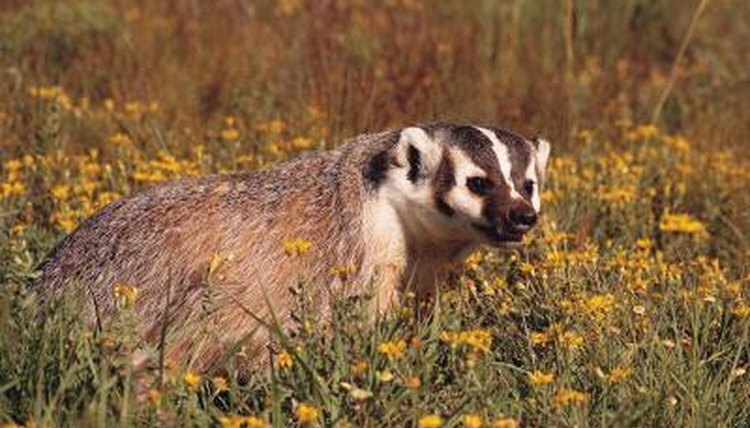 American badgers are short, squat animals with distinctive markings. They generally measure between 20 and 35 inches from nose to tail and weigh roughly 9 to 25 pounds, with males far larger than females. Their coats vary from gray to reddish, but their most noticeable features are their black faces that have bold white stripes running from their noses, over their heads and right down to their rumps. Solitary creatures, American badgers generally only seek out the company of their own kind in late summer or early fall, during mating season. For the rest of the year, they move around their territories, sleeping in burrows during the day and coming out to hunt at night. These burrows often consist of more than 30 feet of tunnels, with a separate sleeping chamber roughly 10 feet underground. They often have several burrows dotted across their home ranges. During the winter, they're mainly inactive, although they're not true hibernators. As a primarily carnivorous species, American badgers hunt for a range of mammals, birds, reptiles, amphibians, insects and other arthropods. Common prey species include moles, gophers, voles, ground squirrels, prairie dogs and bank swallows. However, they'll also eat plant foods such as corn and sunflower seeds, if necessary. They catch most of their meals by digging for their prey in the ground, as they're much quicker at digging then they are at running across open areas. They've been known to store food for later consumption.